I use Microkid’s Related Posts, https://wordpress.org/plugins/microkids-related-posts/ that meets my needs very well, but as it is not updated over 2 years has become very vulnerable to hacker attacks, like to take some doubts with you before buying the product. In your plugin I can type the keyword and it tells me the articles related to this keyword? In your plugin I could put an external link from another site as related article? I await his return and good work. Q1) Yes. If you type in keywords that match the post titles the list will filter. Q2) No. The dropdown list can only contain posts from that post type. When the plugin is ready for the 4.1 version of WordPress? Could you insert that function to add articles from other sites by the plugin? Congratulations for your hard work, I am finishing my doubts to take to get your product which is very good. I look plugin developer response to buy the plugin as soon as possible. I will not be inserting a function to add articles from other sites. When the plugin is ready for the 4.1 version of WordPress? The plugin already works with WordPress 4.1. Hi, is there a shortcode? Looking for a manual related posts plugin that my users can place from within Visual Composer. This looks promising. Thanks! Shortcakes are supported in the latest version. Hello, I’ve a pre-sale question: is it possible to customize the related post display by posts’ category? For example for posts in category A I want the related posts to be displayed with thumb+title, for posts in category B I want related posts to be displayed just with title. Is it possible with your plugin? Nice plugin! Different way to organise content, easy to use… Is there an easy way to check if there are fcnGetManualRelatedPosts and then conditional display? Just dropping by to say this is a great plugin. Its surprising that no-one else seems to have done it, when auto related posts can be so random and eat so many resources, this one give you 100% more control with just a little bit extra effort. Could use some work on the back end, the button to add another related post has no text inside it, sometimes the related posts section appears on dashboard screens that are neither Posts or Post types. But it does a job that nothing else does, and the code snippets are pretty straight forward. I’m keen to find out why the button to add another related post is empty. What language is your WP site using? Do you get any PHP errors? Hello. I have bought your plugin because it really seem to accomplish the simple task I am looking for….I read on the plugin description that it should support also the custom posts in Wp, but I cannot find my CPT (created via the plugin Types for WordPress) in the dropdown menu. I also would like to know how can I style the results on the front end. You can style the posts on the front-end just like you would for any WP post so I’m a bit confused by your question. Hi have a couple of pre-sale question regarding manual related posts. 1. Is it bidrectional? If i related Post A to Post B will post B have a link back to A? 2. if i related Post A to B and C can the post relationship be automatic to A, B and C. That is, all of them link to each other? 3. I currently use https://wordpress.org/plugins/baw-manual-related-posts/ is there a way to keep/import the already related posts? Have you an issue please ? Thanks for your return ! Apologize for my poor english ! I’m looking for a plugin to do what I see in the screenshot for this, but with a little different purpose. I only need to see the plugin in the dashboard, don’t want anything showing up on posts or pages. I want to enter in the related posts/pages I choose. Then I want the plugin to take me to the link with a simple click on the link/button in the dashboard, and it immediately opens up the page/post in edit mode in the dashboard. You would think this would be an easy thing to find, but I have been searching for hours and it doesn’t apparently exist! What would be even better is if it could create the edit link button based on id information already in the page/post I am editing. So if it says ID #273 in Field #10 of this page/post, if I click on a button, it automatically takes me to edit post or page ID 273. If I am in the next post and it says ID #1459 in Field #10 of this page/post, I click on the button and it takes me to edit post #1459. Simple idea for Site Administration, and I can’t find it anywhere! Also – we have over 1,000 posts and I am unable to search in the post selector box. I start typing and nothing. Hi Shaun- I just installed on a test site with default theme and meta box works okay so seems to be a theme conflict which I’ll look into. However even on this install, I can’t search for posts. Ok – worked out the meta box is broken because our site is using en_AU language. Once I switched to en_US, the meta box title and button appear as they should. How can we make this work in en_AU and also how do we “filter” or search for posts (still doesn’t work with en_US). Dear Seandelaney, it is possible to show the complete content of a related post? At the moment i only can show the excerpt, but i need the content. Is it easy to solve? Hi, Sean. Nice plugin, but on WPML site my custom posts are duplicated in the select dropdown of your plugin related posts. Guess how to fix this? (For example, recently I had the same issue with Gravity forms select and resolved this by adding ’’suppress_filters’ => false’ to my functions.php.) I need your help. Hello, I don’t have WPML so I can’t test for this. If adding ’’suppress_filters’ => false’ to the functions.php file works, then edit the plugin yourself. Hi. Your plugin does not work with WP Version 4.7.4 and Total theme. can you fit it ? Just tested the plugin with WP v4.8.1 using the default “twentyseventeen” theme. Everything worked as expected so the issue you’re having is not related to the plugin. I cannot support specific/custom themes. You will need to edit the Total Theme yourself and/or use the code examples I provided. I just installed your Manual Related Posts plugin and specified three related posts on a specific post. I expected they would show up at the bottom under “Related Posts.” They don’t. What am I missing? What do I have to do to get the selected “Related Posts” to be displayed at the bottom of the post under “Related Posts”? Do I need to edit the content-post.php file? I am using the BeTheme from Envato. Have you looked at the code examples? Unless there is something within the BeTheme causing the issue, then I can’t say for sure. Related posts appeared with no issues. Hi, have just installed this plugin. I can select one post but the ‘Add Another’ button doesn’t do anything? I like this plugin, it’s great. The only problem is that it doesn’t seem to display properly on Traditional Chinese WordPress? I’ve installed the plugin and see the UI to relate posts in the editor screen. However, the posts list is empty. Please advise. 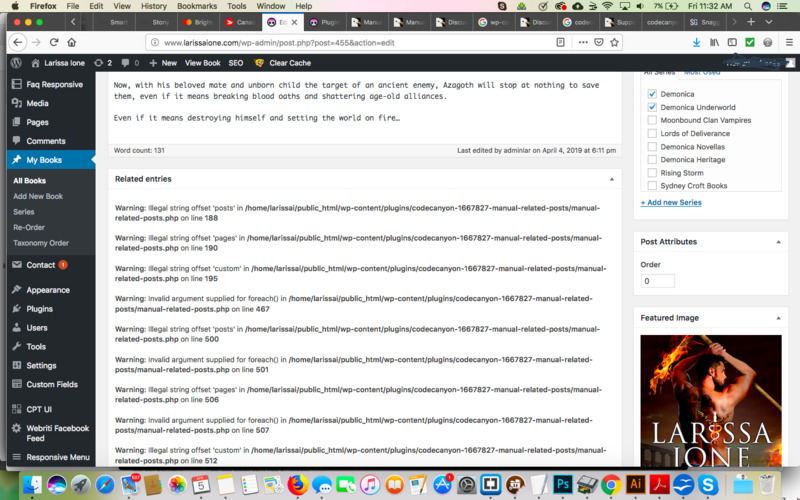 My website is just recently started showing an error on my custom post types page editor relating to the Manual Related Posts plugin . You can find a screenshot at https://snag.gy/uSvhcI.jpg .